Although we live in a cool climate, we have been growing Yacon for around 10 years. They are very easy to grow, productive and produce sweet tubers that can be eaten raw. The tubers are sweet enough to be used in a fruit salad. 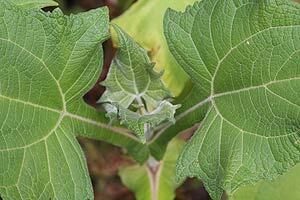 When looking at how to grow Yacon in the home garden, it is best in a warm position. They do prefer a humus rich moist soil. Plant tubers in late winter. Remember that they will grow to 2m, so give them space. Plant after frost danger is over. Harvest when the plant starts to die, although many growers will ferret out a tuber or two well before this. The fruit or tuber becomes sweeter the longer they are stored, store in a dark place similar to potatoes. To flower properly, this is a plant that requires a a fair bit of sun, and although fairly tough and tolerant of poor soils, tubers will grow a lot bigger in a loose fertile soil. Start by preparing the soil well, dig over to a good depth, around 40cm deep, with lots of well rotted compost and some good organic fertilizer. Try to use a low nitrogen fertilizer unless you want lots of foliage and no tubers. These are plant that is sold as a crown, planting steps are outlined. 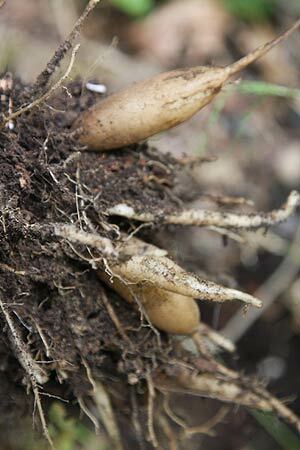 Harvest tubers as plants die back. The smaller reddish tubers are used for propagation, the larger dahlia like tubers are used for eating. Regarded as a super food, this plant is a tuberous perennial from South America. Easy to grow, and used as a staple food for centuries, the Yacon goes under a few common names including Peruvian ground apple. Now available for sale in many countries they are grown in Australia, USA, Japan and through Europe. In terms of the the ‘super food claims’ it is a good source of inulin and oligofructose, it is said to be good for the digestive system and the immune system. The botanical name is Smallanthus sonchifolius, syn. Polymnia edulis, and Inulin is a soluble fibre that is aid to help lower cholesterol amongst other claims. Inulin is also an indigestible sugar. If you happen to be in south America You may also find the plant referred to as llaqon or yacumpi. Although sold as syrups and powders and used as a sugar substitute, it is really for the edible roots that the Incas grew the plant. However the super food craze has found the original product a little difficult to market, so it is now processed. You will find Yacon sold as a sweetener, said to be useful as a pre-biotic and to help the digestive system eliminate toxins. We use the tubers themselves, grated freshly over a salad just before serving, or thinly sliced and served in a salad. With a crisp and crunchy texture chunks of the tuber can also be used in salads, however once peeled or cut it has a tendency to go brown very quickly so toss in a little lemon juice to prevent this. Other uses include, soups and stews, stir fries, and as main ingredient in salads. The tubers themselves have a sweet taste when harvested, they are juicy and taste a little like a pear or pineapple. The word Yacon actually means water root and this refers to the juicy nature of the tuber. Why don’t’ we find these plants in the vegetable section at the supermarket? Just because it is difficult to store for long periods.